I’ll admit it; I was pretty hard-pressed to decide who would be the very first DC 75th HeroClix Preview. I was in a pretty tight spot; should I choose a figure that’s already been spoiled and share the rest of the info (dial, card, etc…)? Or should I choose a figure no one’s seen yet? I tell you, the pressure’s had me tied in knots. And then it hit me; “knots”? Of course! And with it being almost Halloween, why don’t I pick someone who’s a little creepy, a little crawly, and looks like some sort of sinister clown? As you can see, Ragdoll provides some great and inexpensive skills for your force, especially if you’re playing The Parademon from The Brave and the Bold expansion. 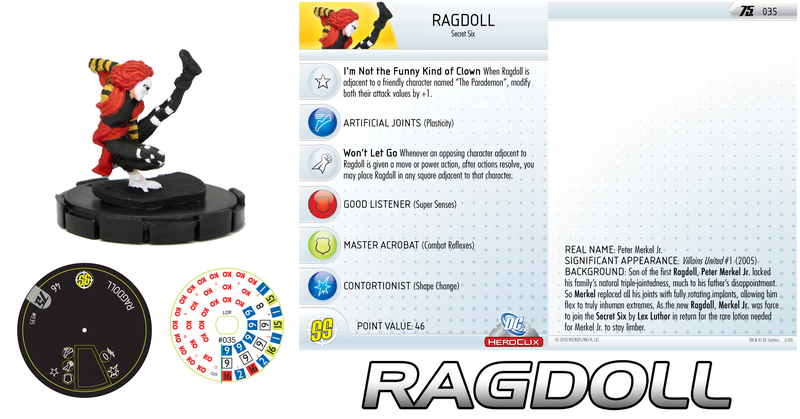 Even better, Ragdoll’s ability to tie up opposing pieces is excellent for just 46 points. What’s more, if the opposing fig moves away, Ragdoll just holds tight and follows them thanks to his Won’t Let Go Special Power! I hope you’ve enjoyed the preview today. Be sure to stay tuned in the coming weeks as we preview even more figures from the upcoming expansion, DC 75th!! !